Last Thursday we had our monthly appointments with the OB & the Maternal & Fetal Medicine doctors. For the most part the appointments went really well. My weight is right where it should be, my blood pressure is good, BB's heartbeat is strong & I feel pretty good most of the time. I do get tired really easy, which is to be expected & lets not even talk about how hot I am - Oh Man! It is going to be a long summer if it stays this hot (high 90s). I did hear this morning that by the end of the week in will only be 88, YEAH!!! Then after the OB appointment we headed to the MFM doctor. I enjoying going so we can see the progress of the pregnancy, but its always a little nerve racking for me too. They have high def ultra sound, which is really cool. She has grown so much since last month & is doing really good. The only concern the doctor had is that he thinks she has a heart defect, a hole in her heart. He wasn't 100% sure & he couldn't get her to move in the correct position so he could give us a definite answer. He says she will be fine & that this is a very common heart defect + it can correct itself. If it doesn't close on its on than she will probably have to have surgery to correct it, but it wouldn't be immediately after birth. We can wait until she is a toddler or older for the surgery. 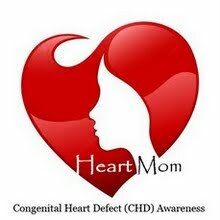 He also told us when we come back in 5 weeks we should be able to see her heart much better & if they think the hole really is there they will call in a Peds Cardiologist. The Peds Cardio doctor will access the ultra sound & talk to us about how to proceed + what to expect. We are so thankful to have a team of doctors so caring & eager to assist us all the way through this process. Also we can't tell you how much we appreciate everyone's thoughts & prayers during this process. We love you all.